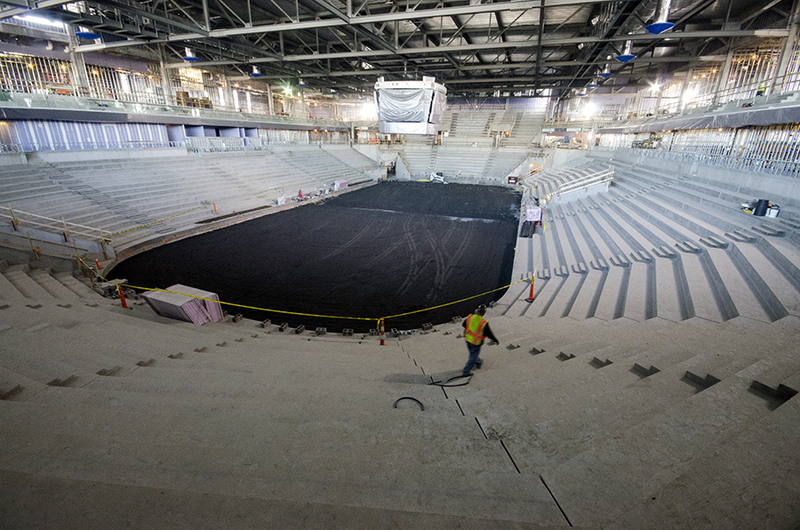 A panoramic view of the main rink. Photo by Tina Hay. Back in October 2010, I visited Penn State to interview for this job. I’d never been to Happy Valley before, and the magazine’s class notes editor and ad manager, Julie Nelson ’86, was nice enough to give me the unofficial tour before I met the rest of the magazine staff. Unfortunately, thanks to my pre-interview jitters, the tour was a confusing blur of buildings and street names (sorry, Julie). But I do remember Julie pointing out the future location of the Pegula Ice Arena. Back then the $88 million donation from Terry Pegula ’73 and wife Kim was the biggest news in town (ah, remember those days? ), and I felt pretty cool later that evening when I could make small talk about the future venue with a waitress. So, just over two years later, it was pretty surreal to find myself standing in the arena itself. Some Alumni Association staffers, including Tina Hay ’83, Julie, and me, got a sneak peek at the construction site yesterday afternoon. Our tour guide: Joe Battista ’83, former Icer and current associate athletic director for Penn State hockey and the Pegula Ice Arena. The arena is still an active construction site—visitors are required to wear hard hats, reflective vests, work gloves, and boots—but Battista paints such a vivid mental picture that, on the way out, it was hard to believe that all we really saw was drywall and metal. —The exterior of the building is mostly complete. With red brick and a wall of clear glass on the east side, the design is modern, says Battista, but similar to other campus buildings. “I compare it to a larger Rec Hall with glass,” he says. —Inside, our first stop was the lobby, at the base of what will be the “grand staircase.” The area features three box offices, an HD video screen, white terrazzo floors, and a large wall graphic that reads Welcome to Hockey Valley. —The student section seats 1,050, which is equivalent to the capacity of the entire Greenberg Ice Pavilion, Penn State hockey’s current home. The student bleachers, with room for the pep band in the center, are the steepest allowed by code. They’re located behind the north goal—the goal that the visiting team will be defending for two of the game’s three periods. “We want the opposing team’s goalie to feel right at home,” Battista says with a smile. Our tour guide: Joe Battista ’83. Photo by Tina Hay. —There are plenty of luxury suites and private boxes, some of them just 30 feet from the ice, so viewers feel like they’re part of the action. Suites will be equipped with HD TVs, where guests can watch replays of the game and order food via touchscreen. And as for the food, don’t expect “reheated chicken fingers,” says Battista. Several cafés, concession stands, and the on-site restaurant will all operate out of a full kitchen. —The varsity teams’ locker room (there are 14 locker rooms total, including some for figure skating and community use) will be especially impressive. Separate men’s and women’s areas will feature hydrotherapy tubs, saunas, and private physical therapy rooms. In each individual locker, super hot blowers will dry damp gear and prevent bacterial growth. —Just outside the locker rooms, players can lounge in a cozy space with couches, big-screen TVs, snack machines, and a ping-pong table—the sorts of amenities that make a difference in recruiting. There’s even a small enclosed area for “stick preparation”—and ceiling vents with suction to remove the leftover dust and debris. “We really tried to think of everything,” says Battista. —We were all wowed by plans for a futuristic “synthetic shooting range.” A high-tech system called RapidShot will allow players to assess their shot speed and accuracy, and compare themselves to other players worldwide. —A smaller community rink with 300-seat capacity is designed for lessons and public use. A cyber café with free wifi (and possibly a fireplace) will overlook the rink, so parents can work while kids practice or play. 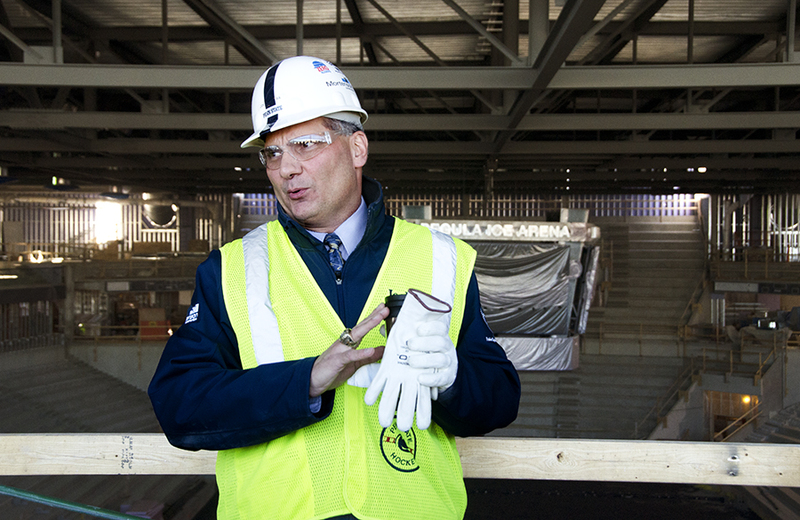 Battista says construction is on track for a September opening of the Pegula Ice Arena. The first Penn State varsity hockey game is scheduled for early October. To see more photos from the tour, check out Tina’s pics on our Facebook page, or take your own virtual tour on YouTube. Entry filed under: Uncategorized. Tags: Joe Battista, Kim Pegula, Pegula Ice Arena, RapidShot, Terry Pegula. Ahhhh, games in “Hockey Valley.” (Love it!!) Another excuse for me and my husband to come back, and it sounds like a cool one. Any defined dates for ticket sales to begin?